THE MECK RADIO SHOW | THE MECK REPORT: Thank you, Meck. Note from Brad Delp's close friend, Bill Faulkner. "The only thing in the middle of the road are yellow lines and dead animals .."
Thank you, Meck. Note from Brad Delp's close friend, Bill Faulkner. I want to thank you for the wonderful, heart felt article you wrote in remembrance of my friend Brad. From the minute he met you in Atlanta, you were part of his lexicon, part of his life, a friend. We would often fondly recall "The Meck", your heart and your kindness. He would always look forward to the southeast shows, as that meant he'd visit with you again. 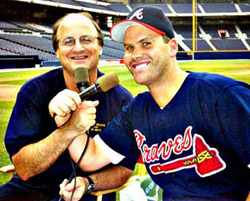 It meant a lot to Brad when you invited him to the ballpark in Atlanta, and we all had a memorable time. You took such good care of us, like we were family, although we had known you for just a day. I have great photos of that event taken by Walter, the legendary Braves official photographer. You have a wonderful heart Meck, and you made an impression on Brad. Whenever we spoke of The Meck, we would smile and a story or two would ensue, always punctuated with an enthusiastic "It's Time To Smell The Cornfields, Baby"! Yesterday, we said goodbye to our friend in a very private ceremony in New Hampshire. Again, thanks for your heartfelt remembrance.